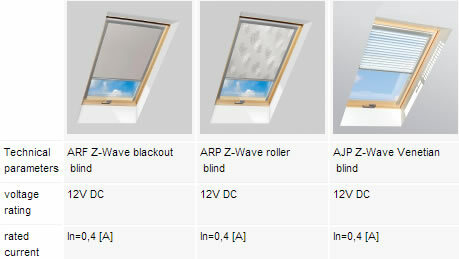 The ARF Z-Wave blackout blinds, ARP-Z Wave roller blinds as well as AJP Z-Wave Venetian blinds protect against the light, pleasantly dimming the interior. They constitute also a decorative element in the loft. Accessories with the Z-Wave module can be installed in a standard window by connecting them via power supply (ZZ60 or ZZ60h) and operated with the use of one of the selected controllers (see operating devices). The internal accessories work when windows are closed.